Old Faithful Snow Lodge and Cabins is an award-winning facility with an appeal that is both rustic and contemporary. 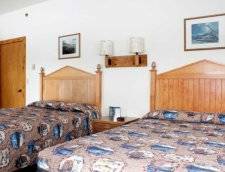 This luxurious retreat was constructed in 1999 and is one of the only lodging facilities open during the summer and winter seasons at Yellowstone National Park. The main building is made of wooden log columns with a cedar shingle roof on top. Some of the lodge's wood was recycled from the same mill that provided lumber for the famous Old Faithful Inn in 1904! 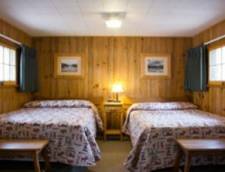 Old Faithful Snow Lodge has 134 spacious lodge rooms or cabins, all with private bathrooms. 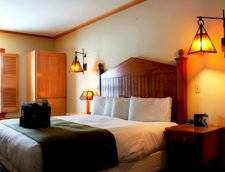 The rooms have western-style furnishings and casually elegant decor. Simpler cabins are also offered to guests who want a more secluded adventure. Exciting packages at the lodge are available throughout the year. A full-service dining room and the renowned Geyser Grill is located here. The Bear Den Gift Store at the lodge is a great place for guests to find souvenirs. Exhilarating snowcoach and other sightseeing tours are also available through the Snow Lodge. Old Faithful Snow Lodge and Cabins is a non-smoking establishment. It is open from December to February in the winter and May to mid-October in the summer season. Radio, television, and Internet hook-ups are not available in order to accentuate the natural essence of Yellowstone. 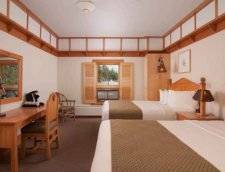 Located in the Snow Lodge, these Western themed lodge rooms feature two queen beds, a private bath and include a mini-fridge. A limited number of these rooms are ADA compliant for those needing extra assistance. (The accessible rooms are located in the main lodge on the ground floor and come with one double and one twin bed, a private bathroom with roll-in showers and accessible toilets and sinks). These modernly furnished guest rooms in the main lodge come with one King bed, private bathroom and mini-fridge. A limited number of these rooms are ADA compliant for those needing extra assistance. The accessible rooms are located in the main lodge on the ground floor and come with one King, a private bathroom with roll-in showers and accessible toilets and sinks. Situated in modules of four and just a short walk to the main lodge, these units built in 1989 are spacious and modernly furnished cabins with two Queens and a private bathroom. There are a limited amount of ADA cabins available for those needing extra assistance, which have an entry ramp from the outside, as well as an accessible bathtub with handrail and portable shower-hose attachment and accessible toilet and sink. Simple, yet comfortable, the Frontier Cabins are duplex-style cabin units situated right behind the main lodge. The cabins are furnished with one or two Double beds and a private bathroom with shower only. Xanterra Parks and Resorts will charge an amount equal to one night per room reserved to your credit card as a deposit. Deposit is fully refundable outside of 30 days prior to arrival. Any changes or cancellations within 30 days of arrival are subject to a $25 fee. SUMMER: Cancellations & changes within 7 days of designated check-in time result in forfeiture of deposit. WINTER - Within 14 days of designated check-in time, forfeiture of deposit. Pets allowed in cabins only. Yellowstone National Park is a natural environment with free-roaming wildlife. Pets are particularly at risk of being injured by park wildlife. For your pet’s safety and the safety of all the park’s wildlife, you need to keep your pet leashed or restrained at all times and not left unattended. Your pet may not be more than 100 feet from established roads and parking areas. Pets are not allowed on trails or in the backcountry.Federal regulation dictates that we are unable to provide transportation for your pet on our buses and snowcoaches. Please consider this when making reservations for those activities. Pets are not allowed in hotel rooms and public areas.In cabin units, quiet and housebroken dogs and cats are allowed. No other pets are allowed in cabin units. A maximum of two pets per cabin is allowed. Guests will be charged a $25 fee for each unit occupied at each location by an animal during their stay. Pets must be declared when registering with the Front Desk. Pets must be leashed or restrained at all times. They may not be left unattended and must be kept quiet. They cannot be left unattended in a vehicle. Food and water bowls may not be left outside, as they attract park wildlife. Guest pet(s) must have all recommended vaccinations currently up-to-date and must be able to provide a Health Certificate and records from a licensed veterinarian regarding their pet(s) if Xanterra Parks Resorts or the National Park Service requests this information at any time. Rates Policy: Lodging rates are per night, for up to 2 adults and do not include tax and utility fee. Additional persons (12 years and older) are an additional $19 per night. Most rooms available online allow 2 to 4 people per room. Accessible rooms are available. Internet service is available in the lobby, public areas, and rooms for a fee. Internet rates: $4.75 per hour, $11.75 per day, $24.95 for three days. Rates and dates are subject to change without notice.